Dorst MediaWorks > Blog > Field Production > Despite Trump, Can Videos Give Voice to the Voiceless? Despite Trump, Can Videos Give Voice to the Voiceless? My video production company, Dorst MediaWorks is based in Washington, D.C., where global nonprofits, USAID subcontractors, and multilaterals are competing to do international development better than the next guy. Trump is already going after this sector in a big way. If he finds support for cuts, it may be because Americans grossly overestimate what we actually spend on foreign aid. This survey found that just 1 in 20 Americans knew that foreign aid makes up only 1% of the federal budget, while the average response was 26% of the budget! There’s a lot in flux right now. But assuming America continues with its small, but impactful, foreign aid programs, I’ll continue to make videos about them. For the better part of 14 years, that’s there I’ve been–specializing in video production for international developent. Our videos illustrate development results, mobilize funds, or raise awareness. Topics include: health, agriculture, governance, the environment, gender, microfinance, and education. So when my company got a new website recently, it made me rethink my mission. First, we worked first on the four main sections: feature documentary films, videos for international development organizations, a bio page, and a blog (great design by Patrick Calder of the Design Foundry). I struggled coming up with something that conveys why Dorst MediaWorks does what we do — and encompasses all stakeholders in the video production process. My company got a new website. It made me rethink my mission. Yes, we’ve been at it for a while: since 2002, we’ve made 250+ videos for 50+ organizations in 15+ countries. And we’re unique. I’ll be the first one to admit that my route into this business was strange and a little circuitous! But it’s turned out to be an advantage for my clients that I have a Master’s in Economics, experience living in Africa, and have made a feature film there (Cameroon). Those experiences shaped who I am as a person, and it helps keep me grounded as I point the camera, write scripts, and edit a story. When I swoop in to a country, I hold a camera and wield influence, and I need to be aware of that dynamic. The people I film trust me, whether it’s a female Ethiopian entrepreneur, a Brazilian musician restoring hope and enterprise in the favela, or a grandmother enjoying clean water in her Manila slum for the first time. Moreover, there’s the prevailing income and opportunity disparities. Few of the people I film have much accumulated wealth. Most would have difficulty securing a visa to travel to the USA (fewer now, given Trump’s misguided Refugee Executive Order). When I point a camera, I’m initiating a relationship: with Kinote the coffee farmer in Kenya; Tich, a brave young man in Zimbabwe; Rabih the fisherman in Lebanon. We are forever linked. That’s a big responsibility. In a world where you can livestream HD video to Facebook’s 1 billion users with three clicks, sometimes that responsibility is lost on people and organizations. My mission statement would need to reflect that. If capturing footage implies a social contract, editing is fraught with ethical implications. Once you string two clips together, your video is no longer objective. Non-fiction stylings, sure, but framed within an illusion of causality. And in this sector where rich-country organizations and filmmakers are telling stories about poor people, ethical choices are inherent in creative choices, whether we acknowledge them or not. All this was running through my head as I agonized over a good mission to help guide my work. I like that it keeps my focus both on my client (who is paying me and has power) and the people we choose to film (who I will likely never see again and who have little power). If I amplify the voices of those with no voice, then I’m using my camera for good. If through my videos, I help strengthen the organizations that are doing this work, then they can expand to reach more people. Little by little, the world becomes a better place. More opportunity and access. A little more peace and prosperity for the other 95% of the world’s population. And for a measly 1% of the federal budget every year, that’s a return on investment that Trump supporters should embrace as well. See for yourself! 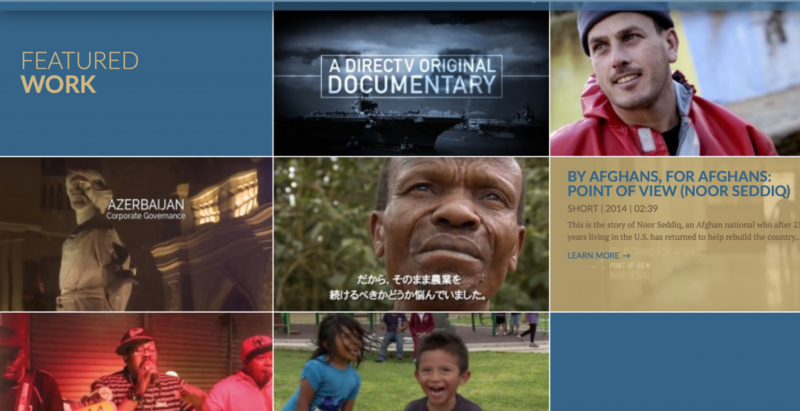 Check out the Dorst MediaWorks portfolio of videos for international development organizations. You can filter by topic (education, health, small business, etc) or location (Azerbaijan, Afghanistan, the Philippines, etc). You can click around on a world map to see where I’ve produced for clients ranging from USAID to Catholic Relief Services to the World Bank. So, can videos give voice to the voiceless? Yes, that’s the goal: to help improve lives, one at a time.